Money Magazine ranked Lee’s Summit, Missouri on its prestigious list of the “Top 100 Best Cities to Live in in the United States.” Lee’s Summit is a remarkable suburb of Kansas City and continues to be a popular destination among those looking to relocate in the Kansas City Metro area. With its close proximity to the heart of KC, Lee’s Summit affords its residents extremely easy access to all of the region's best shopping, dining, entertainment and recreation opportunities. 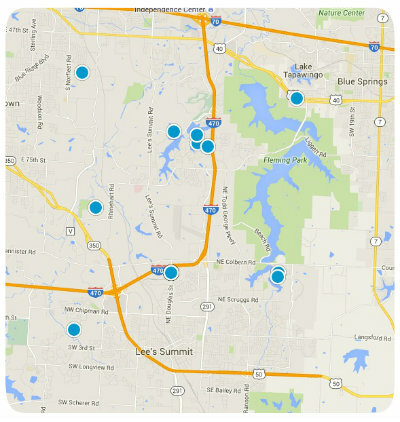 Within the wonderful city of Lee’s Summit there are numerous luxurious communities. The Napa Valley community in Lee’s Summit is both luxurious and affordable. Comprised of three smaller neighborhoods, Sonoma Point, The Vineyards and Vinsana Village, the Napa Valley development is known for its fun yet relaxing atmosphere. Vinsana Village in Napa Valley is a great place to buy or build and Napa Valley has several distinct floor plans from which to choose. Home options in Vinsana Village of Napa Valley include expansive living rooms, elegant formal dining rooms, master suites and gourmet kitchens. Vinsana Village homes are built for living and are found located in close proximity to the many impressive amenities of the larger Napa Valley community. There are scenic walking trails to be enjoyed by Vinsana Village residents and a professionally designed swimming pool as well. Homes for sale in Napa Valley of Lee’s Summit, Missouri have a median listing price of $359,900, or $123 per square foot. Vinsana Village is found in the 64082 zip code of Johnson County and has wonderful single family homes for sale. Homes come in varying sizes, some with four bedrooms and 3,500 square feet of living space. Vinsana Village is a family friendly community served by Hawthorne Middle and Summit Lakes High schools. If you would like to buy a home in Vinsana Village of Napa Valley in Lee’s Summit, Missouri, please do not hesitate to contact us today!